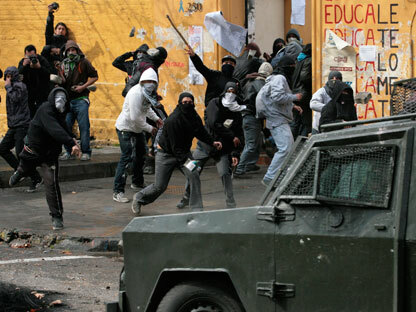 The mobilization of students and workers in Chile is continuing to grow both in numbers and in determination. In the past few days about 600 thousand people have taken to the streets of the capital, Santiago, while thousands more have demonstrated in every other main city in the country.The fight against privatisation of education, which affects mostly proletarian families, as well as those who work in schools, has joined up with the fight for a better sanitation service and for a reduction in cuts to services. During the two days of the general strike on 24 and 25 August, the government responded with an iron fist, sending police and special forces onto the streets to quell any unrest, and they weren’t slow to use water cannon and tear gas. Over 1400 people were detained or arrested; dozens more were hurt or injured, some badly. One young demonstrator, Manuel Gutiérrez Reinoso, only 14 years old, was brutally murdered by police, hit full in the chest by one of the various large calibre bullets fired into the crowds and deliberately aimed at them. Another youngster, 18 year old Mario Parraguez Pinto, was hit in the eye and is gravely ill in hospital in Santiago. After the demonstration the following night, tensions inevitably rose and there were reports of bitter battles between youngsters and the police, with improvised barricades being thrown up, cars being burnt, looting, with dozens of wounded on both sides following an attempted assault on a police barracks. The situation on the ground is now white hot and is overtaking the reformist direction of the opposition parties and the various leaders of the movement, including that of the charismatic Camila Vallejo, spokesperson of the FECH (the Federation of Chilean University Students) and member of the youth section of the Communist Party. At this stage, the movement is on a course for sporadic struggles and brutal repression lasting for months. In fact at the start of the protests, the discontent of the students was expressed in vivid and colourful demonstrations choreographed to a student tune. But the response of the government, led by the millionaire conservative Sebastián Piñera, was one of deliberate provocation. In an interview, replying to a call for a ‘free, public and honest’ investigation the President replied, without mincing his words, that education is a commodity that must be paid for, adding finally that ‘nothing in life is free’ (1). It is worth betting that reading this brutally sincere declaration, various industrialists and exponents of the bourgeoisie will be jolted from their sleep, nostalgically missing the more subtle manipulations of the previous centre-left government. However for the proletariat, the opposition is no longer credible. Although it’s true that the privatisation of education and the cancellation of vast levels of the ‘social state’ were started in the final years of the Pinochet dictatorship, we must remember that the various centre-left (2) governments who, over the last few decades have taken on the leadership of the country, have carried on the work which the bourgeoisie was already doing with varied intensity, not only in Chile but globally. The previous government, led by the socialist Bachelet, was in fact trying to carry out an identical “reform” (3). And in fact, another change of government won’t change those deep-rooted policies which always depend on the dominant interests of the bourgeois class. In fact despite their good faith and their sincere and generous commitment, young people emerging as the leaders of a movement are doubly to the old parties which have ruled the country for many years in the exact same old direction. As long as they remain in the orbit of the institutions of the bourgeoisie, it is inevitable that there will be an adaptation to the so-called ‘incompatibility with the system’ and to the diktat of the ruling class, which wants workers to be ignorant and enslaved as much as possible, trained in basics in secondary schools or, when useful, in universities, but never anything more than that. They are certainly not interested either in culture or quality education for the masses. The fact that Chile has been, to a certain point, stable over the last few years (thanks mostly to the revenue from copper mining), doesn’t change the interests of the dominant class, who would rather reinforce the armed forces and redraw their frontiers in the sphere of imperialism than improve the living conditions of the proletariat (4). Any political vanguard which truly wants to guide the working class towards a better future cannot hide this reality. The working class all over the world is excluded from access to education, from health care and from all the wealth that they in reality produce. Instead they must shake themselves up and rise up against this inhuman social system based on exploitation and oppression. (1) In the days following Piñera had to lower himself to make numerous compromises, including a government reshuffle in which he had to expel the Minister for Education, Joaquín Lavín, an economist educated at the University of Chicago and member of the UDI (Independent Democrat Union, the party which the supporters of Pinochet founded at the end of his dictatorship). However he didn’t succeed regarding the trust which he had to have to make his electoral promises credible, including the much yearned for prosperity and the creation of millions of jobs. (2) Between 1990 and 2020, Chile was governed by the Concertación, a coalition of the centre- left, comprising the Christian Democratic Party (Demócrata Cristiano (DC)), For Democracy (Por la Democracia (PPD)), the Radical Social Democrat Party (Radical Social Demócrata (PRSD)) and the Socialist Party (Socialista (PS)), as well as other various formations in between from the Democratic Party of the Left (Partido Democrático de Izquierda (PDI)), the MAPU Obrero Campesino, and the Partido Liberal. At the last election the Concertación appeared together at the Juntos Podemos Más, a coalition initially created by the Communist Party and the Left Christians. Education in Chile has fallen into a condition of absolute degradation, with massive inequalities between the social classes. Only 1.8% of students from poorer families manage to get a secondary school education, while 72% of those fortunate enough to come from well off families manage to get diplomas. This situation ultimately risks aggravating the cause for a reform which favours private schools - which can get funding from public finance - while they leave the state schools to decay, both educationally and materially. The teachers’ unions the students’ unions continue to… debate and discuss in the hope that the ‘friendly government’ will offer a morsel a little less indigestible for students and teachers. But the ‘democratic and progressive’ Bachelet government is clearly demonstrating that the needs of the bourgeoisie fundamentally remain the same, even if it’s wrapped up as political change. Even if the Chilean bourgeoisie momentarily adopts a democratic mask, the substance of things do not change. These reforms are no better than the laws under Pinochet. Water cannon and gas, cudgel blows and cells are all the bourgeoisie means to offer the students and the proletariat. (4) Chile spends around 4% of its gross domestic product on education, but less than 1% on state schools. Around three quarters of the cost of higher education are left to the families to find. Of the 3.5 million students in advanced education, 40% attend state schools, 50% attend partially subsidized schools and 10% attend private schools. University fees easily reach $1000 a month and the average student graduates with a debt of between $40-45 thousand on their shoulders.